Silver Brook Estate is a Coffee Estate a mere 6 km short of Madikeri. The Cottage is set amidst lush green plantation near a brook which flows through the estate. You can either relax completely reading a book from our library, sitting snugly next to the fire place, or actively take part in various indoor and outdoor games. Soak in the charm of Coorg and revel in the view of Madikeri town from the verandah of this landscaped house, located near the entrance to this once colonial hill town. Sink into our spacious double room; contemporary attached bathroom; just what you might expect. For your exclusive use are the living room, dining and kitchen with a fridge, microwave and gas stove. Whip up your own favourites or hop across to one of the restaurants down the road. Madikeri – 571 201. Coorg. Perched atop a hill, Jade Hills near Madikeri offers a commanding view of verdant hills and countryside. The property is owned and developed by a family of architects. It consists of four independent rooms with attached toilets, drawing, dining, fully equipped kitchen,etc. Nestled in one of the more scenic corners of the picturesque hill station Madikeri is SAYURI, located a stone’s throw away from the Raja’s Seat Gardens. Here one can enjoy the hospitality, comfort and warmth of a home with a touch of class. Sayuri offers you a choice of old world charm in our Kodava heritage home which will take you back in time …or simply enjoy contemporary style. 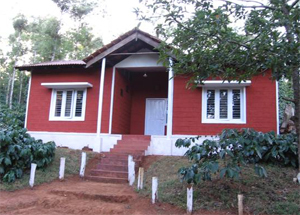 SAYURI is the ultimate choice of many Indian and international tourists who are looking for a peaceful stay in Coorg. Roshan Homestay is a luxury homestay in Coorg, situated at about 4000ft from MSL. This property is surrounded by lush green forest on one side and Madikeri town on the other side with a picturesque view. The property offers all amenities like LCD TV, microwave oven, mini bar refrigerator, Internet, a Club House with pool table, table tennis and other indoor games like carrom and chess. Situated only a few minutes from the spectacular Raja’s seat in the heart of Madikeri town, 5000 feet above the sea level in midst of the cold misty mountains of Coorg, the Scotland of india, lies Valley View luxury holiday villa – A duplex three bedroom spacious fully furnished independent villa with superb valley view, modern amenities and total privacy. All modern amenities like TV, fridge, hot water and uninterrupted power supply. Fully furnished kitchen with cooking facility also available in the villa. Tourist car, tourist guide and sight-seeing also arranged. Very close to major restaurants. Total Occupancy : 15 members. Tata Coffee has built a heritage with its coffee brand in the middle of these picturesque plantations and situated amidst these scenic locales is Tata Coffee’s holiday homes ‘Plantation Trail. Accommodation at Plantation Trails is clean, comfortable and spacious at any of the three-bedroom or double storey bungalows. One can also indulge in some light sport at a game of tennis, table tennis, badminton or billiards. Magnolia Estates is a pristine coffee plantation located on the foothills of Arji Hills due west of Virajpet town in Coorg, Karnataka. 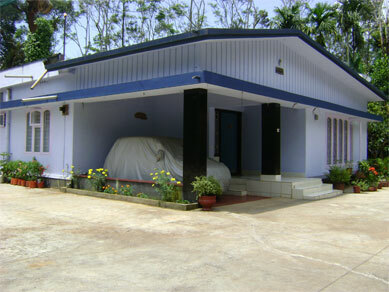 The estate is on the main Coorg-Kerala highway about seven kilometers away from Virajpet. Magnolia Coorg is a theme based resort envisioned to provide our vacationing guests the sightseeing splendor and remarkable hospitality of Coorg in a in a unique coffee estate setting. Located near Virajpet, the erstwhile capital of Coorg Magnolia is very easy and comfortable to access. Sports and Leisure: We offer guests with a variety of indoor and outdoor sports activities such as badminton, basketball-shoot around, softball-cricket etc. You can also indulge in leisure activities such as chess, board-games and reading from our mini-library. Entertainment: various entertainment shows for guests such as Coorgi group dances, singing, Kalaripayattu and other martial arts from Kerala. Magnolia also organizes group games such as tambola or bingo. Bonfires: The staff at Magnolia will light a bonfire in the lawn of the bungalow. Guests can relax around the bonfire gazing at the crystal clear skies or enjoy their dinner outdoors. Honey Valley Estate is situated in the Western Ghats in the heart of Kodagu (Coorg), about 250 kilometers from Bangalore. The Honey Valley Estate is situated in a remote part of Kodagu, near the tallest peak in the region, Thadiyandamole which makes it for beautiful day’s trek. This is just one of the many diverse treks you can do from Honey Valley, taking in waterfalls, streams, coffee plantations and forested hills. The Estate now produces coffee, cardamom and pepper. This is all grown as ecologically as possible, along with our own hydro-electric system. All rooms have attached bath and toilets except where indicated. Hot water is available in the mornings and evenings. Cloud valley is built in a traditional Coorg style. 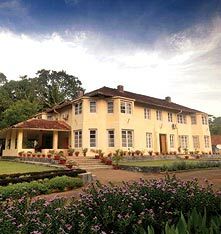 Around 100 years old and with modern comfort and lounge around in the colonial style verandah. Surrounded with lush green forest and with the river running right around it. The River side land is just 1.5 kms from the cottage. Feel welcome to pitch tents here, either on the open grass land or on side of the river. Tents are available with us. It has a four bed rooms with all facilities. veg and non veg food is served. 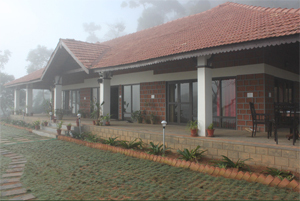 Cloud Valley, Coorg – dormitory type accommodation in a giant attic. A group of 20 people can sleep comfortably in the attic alone. Though we would need to provide the ‘rough it’ options of sleeping bags and bedding rolls on the floor, and not proper cots. Cloud Valley is just 26 km from the base of Tadiyendamol, Coorg’s mightiest mountain. Green, misty and breathtakingly beautiful. Trekking guides can be provided if we are informed 48 hours in advance. This entry was posted in Coorg Hotels, Hotels. Bookmark the permalink. Hi, Mr Kusumakr and Srijith, we had a very nice and safe trip through out the seven days we have rented your car. You really planned very well and as a result of that we saw all the sight places in Mangalore, Karwar, Jog falls, Kollur, Udupi, Malpe, Kasargod in just 7 days, which is really unbelievable. The Innova was brand new and the driver was also very much knowledgeable about the entire routes, local places we visited. Keep up the good service.